Boards reference swim club incident, calls black kids "ghetto monkey faces"
(CNN) -- A group of black Philadelphia police officers filed a federal lawsuit Thursday against their department, alleging an online forum geared toward city police is "infested with racist, white supremacist and anti-African-American content." A group of black police officers claim other colleagues post racist messages on domelights.com during work. The suit alleges white officers post on and moderate the privately operated site, Domelights.com, both on and off the job. Domelights' users "often joke about the racially offensive commentary on the site ... or will mention them in front of black police officers," thus creating "a racially hostile work environment," according to lawyers for the all-black Guardian Civic League, the lead plaintiff in the suit. A look at the site's forums Friday for racist comments found several possibilities. Reads one: "In urban areas, it seems [African-Americans] living on welfare in paid for housing is ingrained in their culture as well as fighting. ... Kids, along with adults can't speak proper English or spell at a 3rd grade level, but they can sing among "theyselves" the lyrics to a rap song." Said another Domelights user of an African-American woman: "She is a classic example of that exact non tax paying, no car insurance driving, bad weave wearing, all the whitey's are racist black women." The site's tagline is "the voice of the good guys." "Every time African-Americans do or say something in our city, we get this backlash of cops who think they're anonymous on this Web site -- just racist, nasty, hurtful things about what we do," said Rochelle Bilal, the president of the Guardian Civic League and a 23-year veteran of the force. The league's attorney said other black officers echo Bilal's statement. "We've heard the same story over and over again, which is that [African-American officers] witness in the workplace Domelights being used and discussed [in a racial manner]," said Brian Mildenberg, whose firm is also representing several campers from a mostly black Philadelphia day camp that recently gained national attention when its members were turned away from a swim club. He said it was "a gift from the heavens in a way that the two things happened at once." While Mildenberg and Bilal said they had been monitoring the 10-year-old Web site for years, the pool incident did seem to play into the timing of the lawsuit. "When they said something about our pretty, brown, young, innocent children and called them monkeys because they wanted to go swimming, that was enough," Bilal said. She may have been referring to this comment posted on Domelights: "Maybe the people who work for a living didn't want to swim with a bunch of ghetto monkey faces." 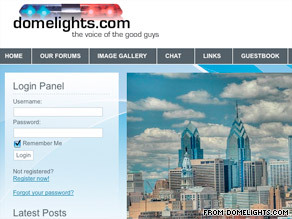 The lawsuit also highlights comments made on Domelights by the site's founder and administrator, a sergeant in the Philadelphia police force who goes by the online handle "McQ." A statement from McQ that Mildenberg described as "racially abusive commentary" reads, "Blacks and other minorities frequently don't have the resources that white people have. Consequently, blacks may not be able to keep their vehicles inspected, registered, and roadworthy." McQ is also listed as a defendant in the lawsuit. Asked why McQ bears responsibility for the racist remarks of his site's anonymous commenters, Mildenberg said it was because "he started it." The person known as McQ did not respond to a request for comment, but posted a message on the site citing the lawsuit. McQ wrote that the suit may cause the Web site to be suspended, but added his statement was not an admission of wrongdoing. "I categorically deny any wrongdoing on my part," the message reads. "I did not make racist posts. I did not maintain the Web site on city time." Ideally, Mildenberg said, his clients would like to see the site shut down. Failing that, they want Philadelphia police officers to be prohibited from posting comments on the site, particularly during working hours. The plaintiffs in the class-action suit also are seeking unspecified financial damages available under the Civil Rights Act for Philadelphia's 2,300 African-American police officers, according to Mildenberg. Shelley Smith, Philadelphia's city solicitor, said. "The lawsuit is about a private Web site. It's not a police department Web site. It's not operated or overseen by the police department. The allegations against the city and police department are misplaced."